A handful of museums today are incorporating sleepovers in their programmes. These educational retreats allow visitors to immerse themselves in the features of their respective museums. The common theme is that they are usually hosted by science and natural history museums. Museum sleepovers started in the 1990s to get young children interested in history and science. But today, some are open to adults as well. Museum sleepovers received a boost in popularity when the Hollywood film Night At The Museum was released. Fast Company reported that museum sleepovers haven’t amassed the amount of revenue the operators intended. Still, museums continue to host sleepovers to keep visitors coming back. They have become strategic marketing tools. Despite its growing popularity however, there is still only a limited number of museums and galleries that hold such activities. From all around the world, here are 5 museums where you can have a sleepover. Aside from the American Museum of Natural History’s educational sleepovers for kids, the Huffington Post mentioned that it’s one of the few which cater to an older crowd. The museum has hosted a number of overnight events for adults over the years, with prices soaring to $350 a ticket. Some occasions even featured famous scientists like Neil deGrasse Tyson. Tourists interested in Viking culture have the opportunity to live like the ancient nomads in Land of Legends in Lejre, Denmark. The open-air museum consists of Iron Age villages, Viking markets, farm animals, artisan workshops, and even a sacrificial bog. The experience is fully immersive where you will have to wear authentic Iron Age clothing, including cotton tunics and chain mail. Guests have the option to stay for a week or over the weekend. Trip Savvy dubbed the ROMKids sleepovers as “Toronto’s ultimate museum backstage pass” and mentioned that this experience is for the whole family. The programme has numerous inclusions to keep guests entertained. Participants enjoy screenings of films like “Night At The Museum”, PJ karaoke parties, and a forum with ROM experts. 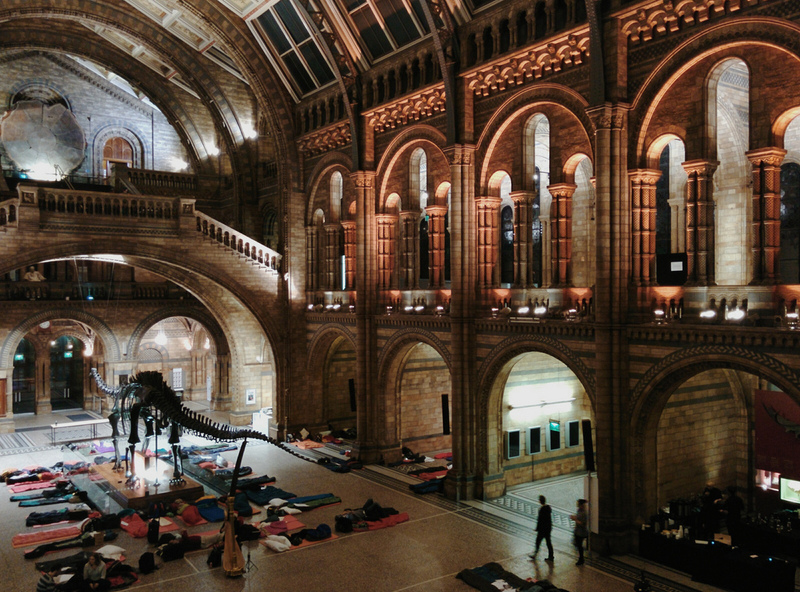 A popular overnight activity for guests of all ages in the Natural History Museum in London, UK is DinoSnores. This event is one of the quirkiest museum and gallery sleepovers. While the kids get to sleep beside their favorite dinosaurs, their adult chaperones are treated to a movie marathon, an open bar, and a unique edible insect taste testing. Wanderlust magazine identified the Museum of Old and New Art as a must-visit in Hobart, Australia. Their program is considered the most decadent of all museum sleepovers. Guests get their own private sleeping pavilions, access to an infinity pool, and wine cellar for evening drinks. At AUD$650 per night, the price and experience are similar to a stay in a luxury hotel. Although you may be tempted to stay up for long periods due to the exciting programmes in these museum sleepovers, it’s still not recommended to do so. Instead, you can use the activities to help you doze off when it’s time to turn off the lights. Leesa states that staying active throughout the day is essential to a better sleep, as the stimulation makes your mind and body relaxed when it comes to bedtime at night. You can roam through the exhibits and exercise your brain with all the educational tidbits you can take in. And consider this: all the information you gather gets stored effectively in your memory if you sleep not long after the experience. So to make your sleepover more unforgettable, don’t forget to catch that much needed rest. And what better way to do it than at a museum sleepover?